99acres – Real Estate and Property Search in India. The new 99acres Windows Phone app is here to take your property search experience mobile. 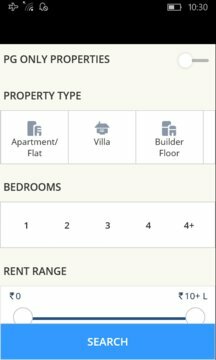 Now you can search and discover properties even on the go. 99acres mobile app makes it extremely easy to search buy, sell or rent property in India. Users can visually explore apartment, farm house, flat, house, builder floor, plot, villa, commercial office, shops, factory through rich photos, attractive videos, interactive maps and many other details. The app also enables users to view photos and videos of society/locality of a property. This free real estate app for Windows Phone has everything you have loved on 99acres.com. 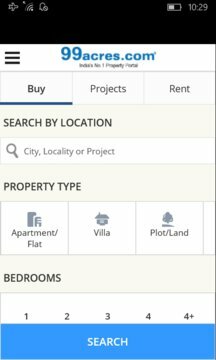 The app has detailed property listings, latest information about new projects and local real estate information. This is surely one of the best property apps for all your property needs. Why 99acres Windows Phone App is the Best Property app in India? ✔ Search property on the Go! :- Finding your dream property on the move is now possible. Add more speed and convenience to your property search. Busy schedules will no longer hinder your search for a home. ✔ A great house hunting app:- Search residential or commercial properties for sale or rent. With photos, interactive maps and videos of localities, societies and properties, you get a clearer picture of what you are looking for online. ✔ Quick information:- You can instantly call or contact the property advertisers, builders or owners and book your home. ✔ Saves money:- The app allows advertisers to post property advertisement for free within seconds. Owners, builders and property dealers , all can enjoy the hassle free experience of selling their property. ✔ Its Windows Phone. It's free! :- 99acres' innovation combined with the native power of Windows Phone will give you the best possible user experience, all for free. ✔ SEARCH: Search easily amongst over 4 lac properties in India and abroad. ✔ REFINE: Use search filters to refine your search and discover the exact property you were always looking for - either Residential or Commercial. ✔SELL: Advertise your property for Rent or Sale within few seconds. Manage your active listings on the go. ✔MAP: View a property on Map along with nearby amenities such as ATM, Park, bus stand, airport, school, restaurant, mall, taxi, railway station etc. ✔ ADD CONTACT: Save the contact details of property advertisers in your phonebook. ✔ MY99ACRES ACCOUNT: Create and manage your my99acres account on the move.